As a relative newcomer to the world of Twitter and Facebook, I will own up to being a complete addict (this, despite being informed today that 40% of Twitter is “pointless babble.” ) And I’ve always been a huge fan of email. But that doesn’t mean I don’t pine for the days when the old fashioned letter was the communication du jour. 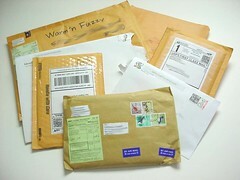 Today, I’m over at PoliticsDaily.com talking about the bankruptcy crisis threatening the US Postal Service . I talk about what it means both economically – in terms of jobs – and personally, for those of us who feel nostalgic for the post. Image: Mail Day! by Warm n’ Fuzzy via Flickr under a Creative Commons License.